This is the first release on the new Danish record label, Freakophonic, a subsidiary of Burnt Hippie Recordings. 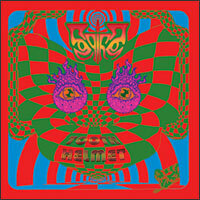 The release is a vinyl only release and limited to 500 copies and features very cool psychedelic artwork. The Tooth Helmet CD was released in 2000 on Metamorphosis but the label soon went under. Side 1 of this record is the original CD, while side 2 features 4 previously unreleased live tracks recorded in 2000 and 2001. See Aural Innovations issue #10 for the original review. The first 3 tracks appear on the new CD called Egoreactor (Reviewed in this new issue) and the last track, "Mau Mau Territory", you will only hear on this release. The versions on here are quite different in many ways, more psychedelic and feature a different drummer, keyboard player and lead guitar than the current line up. The new material starts with an incredible version of "Freedom Fuel". I think the way the keyboard is played and lead guitar makes this version much more groovy and psychedelic than the version recorded on the new Egoreactor CD. "I Ain't The One" is a real foot stomping rock and roller with a more psychedelic guitar than the newly recorded version. "Egoreactor", the title of the new CD, is next and a cool version. I love the riff on this song. "Mau Mau Territory" closes the LP and is a strange song, starting really punky and changing radically and then totally frantic again. A great LP and soon a collector's item! Tooth Helmet is distributed by Freakphonic. You can visit their web site at: http://www.freakophonic.dk.